Through the corridors of time Welsh legend tells us that centuries ago the last of the dragons laid an egg as its final act on this earth. Inside that egg slept the final dragon. Through the help of three kids and Merlin the druid, the egg was hatched and Scorch Bach was born. Fiery and cute Scorch Bach arrived in the world with a sense of destiny and greatness. As the years passed by, the passion and fire within him grew and time drew nigh for his destiny to be unleashed. 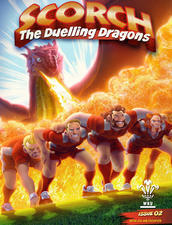 His destiny and Welsh rugby are entwined and the same... fire and passion unleashed on the world! 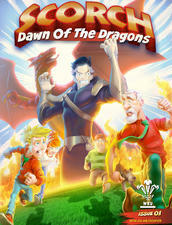 Discover the origins of the WRU’s mascot Scorch by following the story of Rhys, Megan and Dylan as they go on a tour of the Millennium Stadium and get a lot more than they expected. Unleash the Dragon! 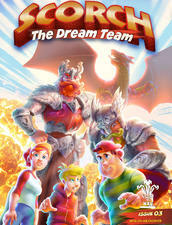 Follow an epic adventure through time, run, duck, pass and navigate your way through five exciting games, find all the hidden objects, reach the end and unlock the secret dragon animation!